Our young owls are now more active so it is easier to photograph them. They are starting to get some colour on their wings. 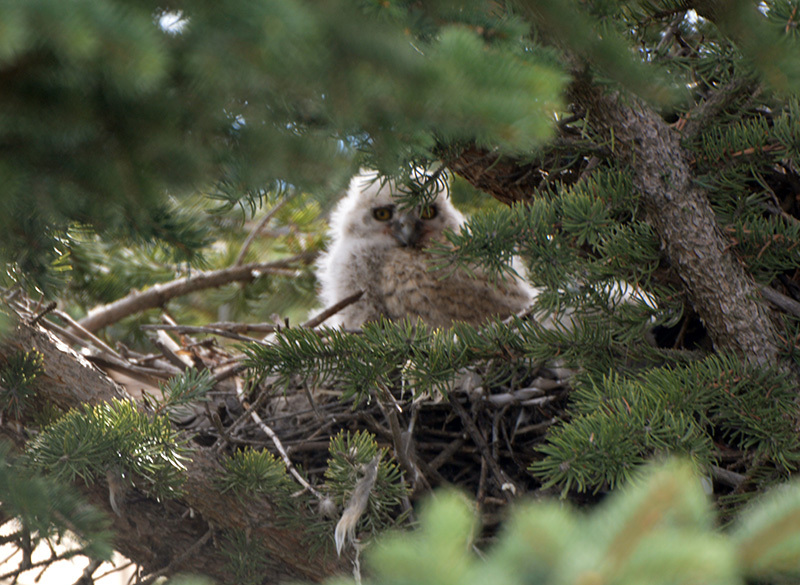 Mum owl is taking a rest from the nest. We went to Waterton for lunch last Sunday and saw some Big Horned Sheep. It’s ironic how the sheep are just relaxing while construction work is going on behind them. A Male Ruffed Grouse is strutting his stuff! Can you spot the Elk way off in the distance? There is a nest along the highway by the Belly River that the Osprey return to every year. Your photos always amaze and inspire me!! Photos gorgeous as always. And I recognize how deficient I am being able to name our wonderful wild birds and animals. The baby owl is beyond cute. Great shot of the baby Owl! That is a Male Ruffed Grouse all fanned out, lucky chance! Remembering an ‘ol grouchy boy who was a curl and a quarter (very handsome Ram) that lived on the east highway out of Jasper Park. Desaster Point was his home and he always kept his ladies in order. Few young rams would challenge him. I miss him ~ he would stand proud for photos 🙂 . . . what a guy !! Thanks again for your attentive photo’s Marlene ~ fabulous.